Today, the EU decided to appeal last week's ruling by the Court of Justice of the European Union. The decision itself was temporarily made on Friday between the EU ambassadors, authorizing the legal services of the Commission to appeal and take measures to suspend the execution of the annulment of the trade agreement, according to Europapress. The decision was formally made today, 14 December, "without further discussion", according to sources Europapress have talked with. The speedy decision making process caused a scandal in Sweden, which have always opposed the inclusion of Western Sahara in this same trade agreement. The Minister of Foreign Affairs gave Parliament only a few hours this week-end to comment on the decision, but she was herself not available for comments to media during that period. 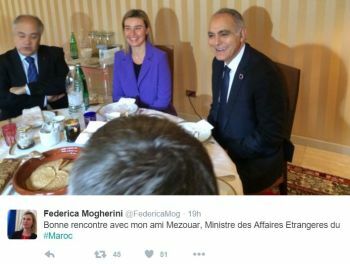 "Good meeting with my friend Mezouar, minister of foreign affairs of #Morocco", Federica Mogherini, High Representative of the EU for Foreign Affairs and Security Policy, posted on Twitter yesterday.The EU and Morocco discussed the court ruling this week-end, as the two partners met as part of its association council meeting. No one from Western Sahara sat around the table. The appeal means that the annulment of the deal is put on hold until it has been retried in a higher instance. A new statement on the affair was also made on 14th December by High Representative of the EU for Foreign Affairs and Security Policy, Federica Mogherini. No mention was made of Western Sahara nor of Morocco's refusal to negotiate in the UN over the matter. The day after the ruling, Mogherini issued a statement declaring that the EU had taken note of the ruling, and that EU institutions were about to examine the decision "in order to identify the different options, notably the preparatory work for a possible appeal." The statement also underlined that Morocco holds a so-called Advanced Status in its relations with the EU and that the bilateral relations have not been challenged. It should be added that the EU's partnership with Morocco on all regards fail to specify the international borders of Morocco. On all levels, Morocco is allowed to introduce the part of the non-self-governing territory of Western Sahara which is under Moroccan foreign occupation into its trade relations with the EU. No state recognise the Moroccan groundless claims to the territory. The African Union this week-end welcomed the ruling of the Court of Justice of the European Union. 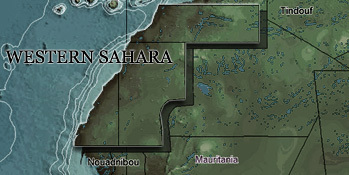 The Western Sahara republic is a member state of the AU.